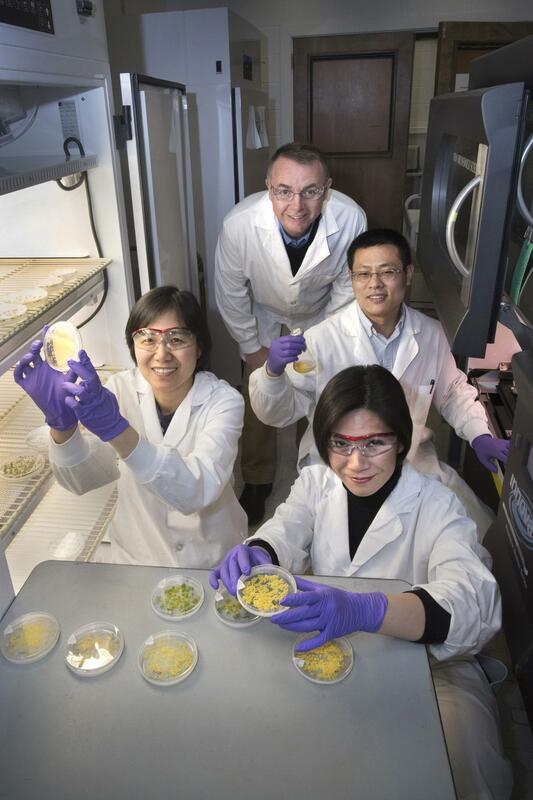 UPTON, NY–Scientists studying plant biochemistry at the U.S. Department of Energy's Brookhaven National Laboratory have discovered new details about biomolecules that put the brakes on oil production. The findings suggest that disabling these biomolecular brakes could push oil production into high gear–a possible pathway toward generating abundant biofuels and plant-derived bioproducts. The study appears in in the journal Plant Physiology. "It's normal for plant cells to down-regulate oil production when we feed them excess fatty acids, and this study confirms our hypothesis about how they do that. But we also discovered that the brakes on oil production are partially on even under normal conditions, which was a big surprise," said Brookhaven Lab biochemist John Shanklin, who led the research. "It would be like driving a car for several years and finding out one day that a parking brake you didn't know about had been on all along. When you remove that brake, the car has much more power; that's what we've just discovered for plant oil production," he said. Earlier work by Shanklin's group in 2012 revealed that when plant cells were fed a short-term excess of fatty acids (lasting less than two days), a feedback loop inhibited this enzyme, so oil production would slow down . As long as fatty acid concentrations dropped within two days, the enzyme and oil production would turn back on. But a longer-term excess of fatty acids would permanently disable the enzyme. At the time, scientists knew of several ways that the enzyme could be inhibited, but none of those ways could explain the irreversible inhibition they were observing. When colleagues at the University of Missouri discovered an inactive version of one of the four enzyme subunits in 2016, Shanklin suspected that this inactive subunit might be the cause of the permanent shutdown–by taking the place of one of the active subunits in the enzyme. He designed this new study to test that hypothesis. Team member Hui Liu obtained plants in which the genes that code for the inactive subunits were individually disabled. She used those variants to breed plants that had combinations of disabled subunits. If Shanklin's idea was correct, cells with disabled inactive subunits would have a lower capacity to turn the enzyme off. "We suspected that disabling the genes would turn off the off-switch for oil production, allowing the plant cells to make more oil," Shanklin explained. When team member Jan Keereetaweep tested this idea by feeding the plant cells excess fatty acids, that's exactly what happened: Cells with combinations of the disabled genes didn't turn off oil production the way cells with the normal genes did. "There was 50 percent less inhibition of oil production in the cells with disabled genes compared to the wild-type plant cells," Shanklin said. That result confirmed that the inactive subunit coded for by the normal genes in the wild-type plants was indeed what triggered permanent shutdown of the enzyme. But the big surprise came when Keereetaweep measured fatty acid synthesis in the plant cells with disabled inactive subunits without artificially feeding them excess fatty acids and compared the results with those for wild-type plant cells under the same conditions. Under those normal conditions, where you wouldn't expect to see oil production inhibited, the enzyme driving oil production was significantly more active in plant cells with the disabled genes than in normal plant cells. "That means that, even under normal conditions, inactive subunits are putting the brakes on ACCase, reducing its activity and limiting oil production," Shanklin said. "Disabling the genes for those inactive subunits is like taking the brakes off the car, revealing the motor's true potential." "This project was an excellent collaboration among Keereetaweep, Liu, and Zhiyang Zhai to answer some basic scientific questions about plant metabolism," Shanklin noted. "Now, the knowledge they generated can potentially underpin strategies to increase oil accumulation in plant species grown for applications such as biofuels or bioproducts." This research was funded by the DOE Office of Science and the National Science Foundation. Scientific paper: "Biotin Attachment Domain-Containing Proteins Irreversibly Inhibit Acetyl CoA Carboxylase"
Earlier work: "Scientists ID Mechanism for Regulating Plant Oil Production"